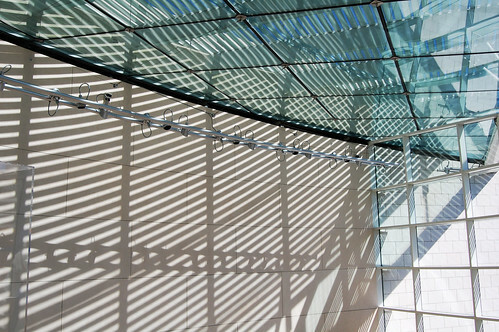 The Jepson Center is in itself a work of art. Savannah’s Telfair Museum is the oldest public art museum in the American South. Originally the home of Alexander Telfair, the Telfair mansion remained in the Telfair family until Mary Telfair bequeathed it to the Georgia Historical Society so that it could be turned into a museum. After extensive renovations, the Telfair Museums opened in 1883. The original mansion was designed in 1818 by William Jay. Today it is home to the Telfair Academy and houses 19th and 20th century American and European art. The Owen-Thomas House, also designed by William Jay, is considered one of “the finest examples of English Regency architecture in the country”. Here visitors may view authentic urban slave quarters, a lovely parterre garden, and decorative arts from the late 18th to the early 19th centuries. The latest addition to the Telfair Museums is the Jepson Center, designed by acclaimed architect Moshe Safdie in 2006; the Jepson Center houses the museum’s contemporary art collection. Many guests of our Savannah Vacation Homes have visited the Telfair Museums and raved about them. Consider visiting the Telfair Museums the next time you stay in one of our Savannah Vacation Rentals. Exhibits, special events, and hours are available at the Telfair Museums.